An aneurysm is either a bulge or ballooning in a blood vessel in the brain that often looks like a berry hanging on a stem. A brain aneurysm can either leak or rupture causing bleeding into the brain. A ruptured brain aneurysm usually occurs in the space between the brain and the thin tissues covering the brain, often known as a subarachnoid hemorrhage. A ruptured aneurysm can quickly become life-threatening and requires immediate medical attention. Often, most brain aneurysms don't rupture, create health problems or cause other symptoms. Such aneurysms are detected during tests for other conditions. The treatment for an unruptured brain aneurysm may prevent a rupture in the future. What really causes Brain Aneurysms? These develop as a result of thinning and degenerating artery walls that are often formed at forks or branches in the arteries because those sections of the vessel are weaker. Although these can appear anywhere in the brain, they are commonly formed in the arteries at the base of the brain. 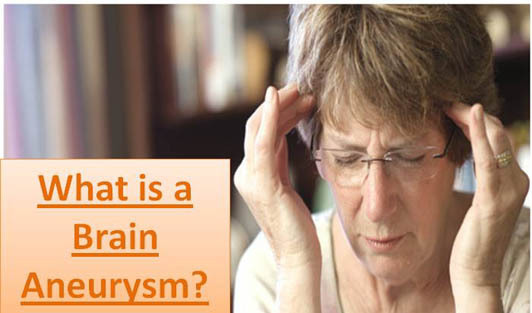 What are the symptoms associated with Brain Aneurysm? In few cases, an aneurysm may leak a small amount of blood and this leaking (sentinel bleed) may cause only a sudden and extremely severe headache. If you have sudden severe headaches, and lose consciousness or have a seizure, seek medical assistance immediately!